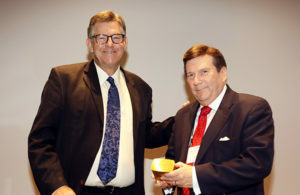 John J. Hentschel, CRE®, president, Hentschel Real Estate Services LLC, Abingdon, Maryland, has received the 2017 Committee Service Award from The Counselors of Real Estate®. The honor, endowed in 1996 by CRE President, George M. Lovejoy, recognizes exemplary volunteer service to the CRE organization. The announcement was made in Montreal during The Counselor organization’s annual fall convention. Mr. Hentschel, former head of the department of real estate for the city of Baltimore, has spent hundreds of hours volunteering his time and expertise to further the diverse goals of The Counselors of Real Estate, focusing much of his time on leading and participating in pro-bono team projects for The Counselors’ public service initiative, the CRE Consulting Corps. He has also expanded recognition of the organization’s thought leadership through his editorial guidance on CRE publications. 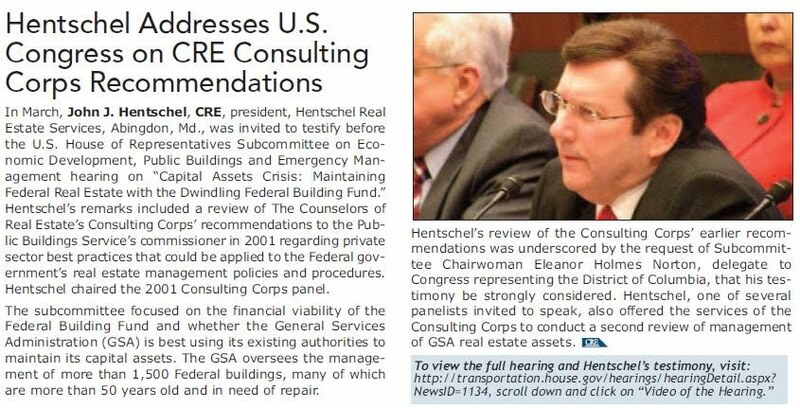 As a contributor to and editor of The Counselors’ peer-reviewed journal, Real Estate Issues (REI), Mr. Hentschel has pursued — and achieved — increased visibility for the publication which highlights Counselors’ outstanding thought leadership and property expertise. Throughout his more than 20 years as a Counselor of Real Estate, Mr. Hentschel has served a variety of positions on numerous committees, including budget and finance, communications, the Real Estate Issues Editorial Board, and the Consulting Corps Steering Committee. He is currently a trustee of The Counselors of Real Estate Foundation and The Counselors’ Board of Directors. He served as a local CRE chapter officer for several years and as a member of the organization’s five-member Leadership Team in 2015. 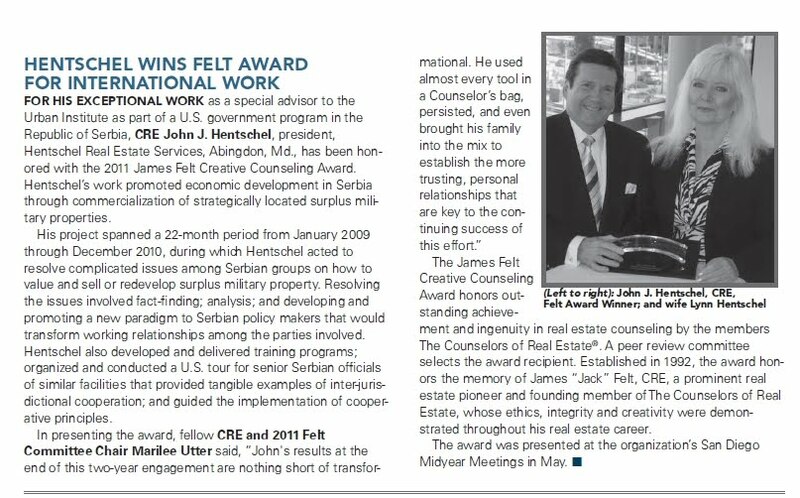 Mr. Hentschel received the James Felt Creative Counseling Award in 2011 for his work with USAID’s Municipal Economic Growth Activity (MEGA) in the Republic of Serbia – an initiative that in part helped local governments foster economic growth and employment by redeveloping and reusing well-located surplus military properties. John J. Hentschel, president, Hentschel Real Estate Services was interviewed on Fox Network's Baltimore affiliate WBFF-TV 45 in an investigative report on a complex, long-term absolute net lease arrangement of a downtown Baltimore office building that houses a number of city agencies. The building was constructed for and leased by the city of Baltimore. The report questioned the merit of an arrangement under which the city has been responsible not only the payment of rent and operating expenses, but also replacement of costly building systems. CASCADE — A group of government officials from Serbia visited the former Fort Ritchie U.S. Army Base near Cascade on Tuesday to study the process of converting surplus military property to other uses. With its remote location and mountainous terrain, Fort Ritchie is similar to many military facilities in Serbia that government officials would like to see redeveloped, said John J. Hentschel, a Maryland real estate expert who is leading a weeklong study tour for the group. “I think Fort Ritchie represents an example of how you transition from surplus military property in a challenging location to an active economic development opportunity that can draw people to the area, and that’s what we’re trying to teach them,” Hentschel said. Fort Ritchie was closed in 1998 and transferred in 2006 to PenMar Development Corp, a state-sponsored redevelopment authority, which then sold it to a private developer interested in creating a business and residential development. The study tour was organized by the U.S. Agency for International Development’s Municipal Economic Growth Activity program, which is helping local governments in Serbia foster economic growth and employment by creating a business environment where the local private sector can flourish, Hentschel said. “What we’re trying to show them is how to take a surplus military property and walk it through all of the processes, from how do you negotiate a deal, how do you value the property, to how do you get it to be a functioning economic development force in the local community,” he said. The visiting delegation included mayors of three cities in Serbia, a representative of Serbian President Boris Tadic, the head of the Serbian military’s infrastructure department, local economic development and planning officials, and officials responsible for appraising the military properties, Hentschel said. John J. Hentschel, CRE, MAI, FRICS, President and CEO of Hentschel Real Estate Services, an Abingdon, Maryland based real estate valuation, consulting and advisory services firm, was a featured speaker at a recent working breakfast for the Serbian media held at the Balkan Hotel in Belgrade Serbia entitled “Construction Land Management in Serbia”. The event was organized by the Urban Institute’s project Municipal Economic Growth Activity (MEGA) sponsored by the US Agency for International Development (USAID) for whom Henstchel has been serving as a special advisor. Hentschel’s presentation dealt with expanding national wealth through mutual co-operation between the Serbian Defense Ministry and local Municipalities as a means to enhance the value of surplus military properties, and to attract private investment for their economic and physical redevelopment. His comments were thereafter featured in a variety of Serbian radio, television, newspaper and magazine reports. Organized in 1973, Hentschel Real Estate Services provides real estate advisory, consulting, valuation and transaction expertise to business and government leaders as well as to legal, accounting, development, and financial services firms in the U.S. and abroad. From 1982 – 1992, Hentschel headed the Baltimore City Department of Real Estate serving as the City’s Chief Real Estate Executive.